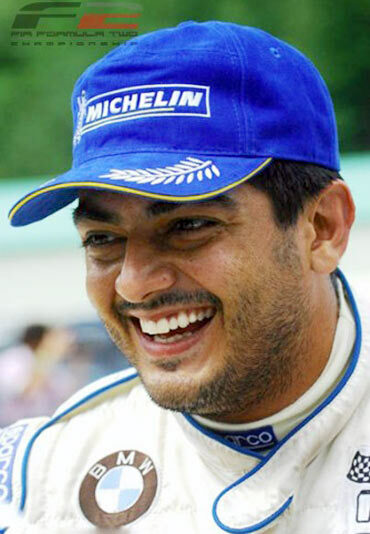 Rediff.com » Movies » Exclusive: Ajith living his racing dream! Tamil star Ajith Kumar created a buzz when he decided to fulfill his dream of racing at the 2010 FIA Formula 2 Championship in Europe. 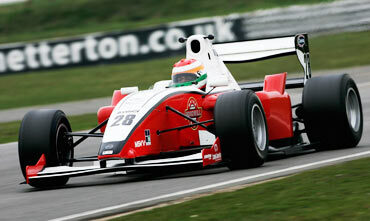 After training himself in Malaysia, Ajith moved to Snetterton to start the test racing. In the first test that took place at Snetterton on April 6 and 7, the actor finished 22nd. The second test will take place today (April 12) at Silverstone with the first race from April 16 to 18 at the same place. How was the preparation in Malaysia? In the past, I have only driven racing cars with stick shift sequential gear boxes whereas the Formula racing cars of today have the paddle shift and clutch behind the steering wheel. The Renault V6 test in Malaysia really helped me get used to paddle shifts (gear change) and left foot braking. Did the preparations help you finally for the Formula 2 tests? They obviously helped me get used to the very high speed that racing cars of today are capable of achieving. What was going through your mind when you were getting ready for the April 6 and 7 tests at Snetterton? My main objective was to learn as much about the car as possible. I spent a lot of time with my engineers to understand how to set up the car and how the car would behave to every little set up change made. Honestly, I was not looking at timings at all. I was calm and collected and in the process, my lap times kept improving. You finished last in the tests. Were you unhappy with the result? Considering the fact that I have not sat in a racing car for the last six years, I am very pleased with my results. I was 2.6 seconds off the fastest lap set and only 9/10 of a second off Parthiva's lap time. We have another test at Silverstone on April 12. The first race event will be held on April 17 and 18 there. There will be two qualifying sessions on April 17 and two races on the 18th. The Williams JPH1B F2 car was designed by the Williams F1 team and features ground effect aerodynamics and a sophisticated composite survival cell complying with the 2005 F1 safety regulations. Other than you, there are two more Indians in the circuit. Armaan finished fifth in the tests. Did you three talk about the test later? What kind of interaction do you people have generally? Armaan and Parthiva are very talented drivers. In fact on the second day of test (session 2) Armaan finished in the top three. Overall, Armaan finished fifth. I am happy for him. Parthiva's car had electrical problems. I am sure he will do very well at Silverstone as the mechanics have sorted out the problem. Armaan, Parthiva and I feel extremely privileged and happy that we are representing India in the most fiercely competitive Formula 2 European series 2010. And as we will be away from our respective families till October, we feel like one big family here. We do talk about our experience, share data and most importantly have each other for moral support. What are your plans for the first race at Silverstone on the 16th? To be calm and to complete the race with respectable lap time. Finally, how does it feel to be a sports person after a gap? I am living a dream! I am very grateful to my dear friend Narain Karthikeyan for making all this possible.